Increasing oil & gas exploration in North America due to lifting of oil export ban coupled with advent of technologies such as hydraulic fracking will spur regional drilling activities. This will positively influence the entire attapulgite market growth in coming years. The product is used as suspending agent for the saltwater applications such as in offshore drilling and also effective for granular, fibrous and flake materials drilling applications. In the last quarter of 2017, the U.S. GDP shows the growth rate of 2.9% and it will continue to grow with decent pace subsequently increasing investment in oil & gas sector. The above-mentioned trend is expected to follow and will fuel the product demand by 2024. 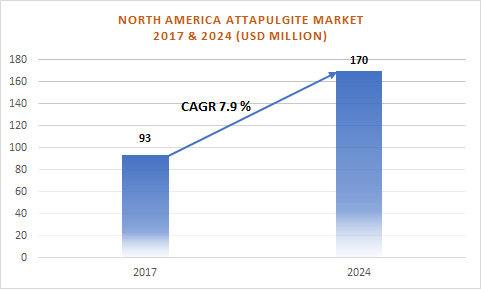 The North America Attapulgite Market value exceeded USD 93 Million in 2017 and is expected to rise at a CAGR of over 7.9% from 2018 to 2024. Based product type attapulgite market is broadly segmented into colloidal and sorptive grades on the basis of their physical and chemical properties. Colloidal grade finds a very wide range of applications in washing powders, liquid suspension fertilizers, wax emulsion stabilizer, gelling agent, paint thickeners and in oil well drilling mud. This segment holds a significant market share in North America attapulgite market and shows the growth rate of almost 3% throughout the forecast span. The prominent players in the attapulgite market include Halliburton, Oil-Dri Corporation of America, Jaxon filtration, Gujarat Multi Gas Base Chemical Private Limited, MinTech International, Inc., Active Mineral International LLC, etc.